I would like to be able to control which sales channels my products are available on while importing. My products need to be available on the POS as soon as they are created but should not available online immediately. With the current "Published" field I can only have available everywhere or nowhere (True or False). I contacted shopify support and was told that this change was made to allow for better improvements in the future, that was over three months ago and the issue still haunts me as I import products a few times per week. Would it be possible to add the sales channels fields to the product import file so that we can control the availability per channel? You could take a look at https://excelify.io/ app. There you can make even scheduled regular imports using CSV or XLSX file to only update certain fields or to create new products so you can further automate your product imports. In our import format, there is column 'Published Scope' and by setting its value to 'global' respective rows product will be published to both the Online Store channel and the Point of Sale channel. My goal is to have my imported products available on the POS but not available online, can excelify help me with that? Thanks for taking the time to post your request. I will pass this frustration along to our team. One hurdle I can see coming from changing this entry option is the practicality of the additional columns. Would we need one column for each channel (reading true or false?) or another option altogether. I can see this being a bit of a hurdle as the number of channels available grow and change, and differ based on regions that we support. That's not so say it can't be done, but these are some of my thoughts as a non-Developer on our team. That being said, have you tried the option that Renars mentioned? Another possible workaround could be uploading CSVs unpublished and then using the bulk editing feature to define the channel availability. This is obviously another step to add before getting things live, but, could be a nice option for the meantime. If you're open to trying the Bulk Editor, I'd suggest reading this section as well - Shortcuts in the bulk editor. I hope that some of these options help you move forward! If you had any more detail or info to share on why you want to see this change in CSV uploads, please let us know. Having more information on how this affects your workflow and business is really helpful when Devs decide on what features to change! I really appreciate your response! I understand adding more columns is not ideal and not a great long term solution as new channels are regularily added. I would suggest not defining the POS as a sales channel to avoid this problem. In that case it would be one extra column to determine POS visibility and the other channels could stay grouped together in the "Published" field. Renars app does not seem to provide a solution, my goal is to have my products availble on the POS during import but not available online. His solution is to automate the imports and only update certain fields at a time but as there is no field specifically for the POS so this will not help me. The bulk editor is a great option but as you mentioned it is very similar to my current workflow so both seem to be the best options right now. We sell unique products, so every single product has a unique SKU and no variants. We are currently adding and selling around 100 products per week but this number continues to rise. All new items are added to a spreadsheet and then imported to Shopify when they reach the store. Once they reach the store they need to be available for sale on the POS. After a week or two if the product is still in stock we will add in a description and photos and publish the piece on our online store. One last issue that I can see coming is the product limits on the POS. with my current workflow I lose control and by default have to have all products available on the POS. At some point I will reach the product limit on the POS and will not be able to hide products to accomodate the limit on the Ipad as my workaround involves selecting all products not available on the POS to make them available. Please let me know if that is not clear! Max again. Thanks for taking the time to write in with a bit more info about your workflow and specific concerns. I'll add those to the conversation around CSVs for our Dev team. Are these products that you're selling in person ones that you're hoping to keep in stock, and track inventory of? Because if it is one-off items or custom projects, you might find a combination of the workflow you're currently using and adding items with the quick sale option could help! 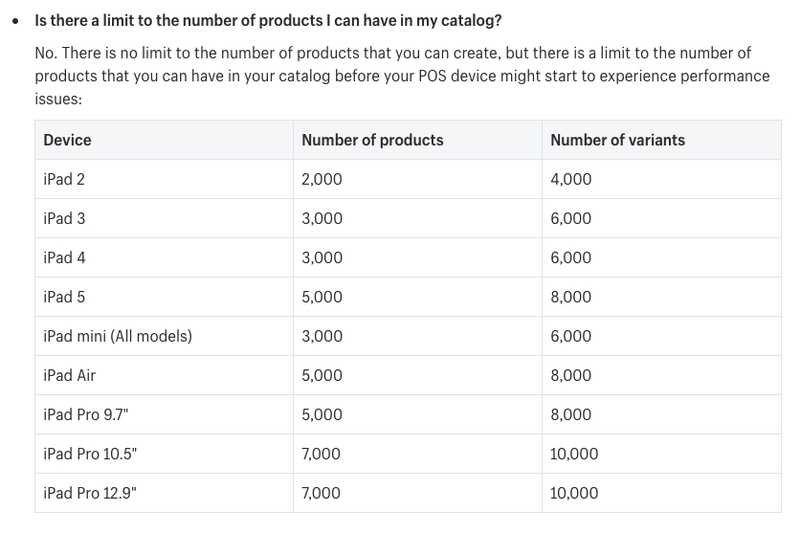 For anyone wondering about the limit of products that can be used on your mibile POS device, there's some more information on the iPad versions and the number of products that can be added available here. Let us know if you have any more questions or have tried any more workarounds. This is something I struggle with also. So, I came up with a workaround so I could easily and quickly update the availability of products. In the tags field, I add a tag specific to the items I want to make available online only or POS only and so on. Then after I upload the products, I can use the bulk editor function to search for all products marked with a certain tag and bulk make them available on whatever channel. Example: tag products in spreadsheet with POS. After upload, apply a filter in the search: products tagged with POS. Select all and then make available on POS. It would be nice to have this right in the CSV upload, but for now it works for me as I'm adding hundreds of products weekly.